How Far is the Project Site? If you are a client and making an inquiry to an agent, the first thing you would want to know is the location of the project. These days, residential housing is no longer applicable at Metro Manila, buyers should accept that fact, unless you are planning of condominium living. Buyers of residential housing at 90’s were very fortunate to have availed residential housing property in some parts of city which at the time is not yet a developed area and been fortunate with their decision because of business development come in their neighbourhood. The trend will also be the same, whereas the towns of Cavite, Laguna and Bulacan will become progressive cities; actually some of cities in these provinces are now progressive like Sta. Rosa, Calamba and Dasmarinas City. If you have been in these places, you would see it as next extension of Metro Manila. Going back with project location, if your budget belongs to economic housing that is around 1 Million you can find a good project around the places of Imus, Gen. Trias, Silang, Carmona and others towns in Cavite and others towns in Laguna. Having said of the possible locations, if you are not familiar with the location of certain project you may ask your agent about it or personally make a research about how far it is, for example from Alabang Metropolis or Baclaran Church for South Projects as your point of destination. I’ve come to encounter that situation before on one of my clients, a Filipina with a foreigner husband. For my Filipina client, the location is not a problem after our site viewing, since she is not also familiar with the location he asked me to explain it to her foreigner husband and his first questions was: How far is the project from Baclaran? That question gave me an insight how very detailed foreigners are. Instead of asking how many minutes it would take to travel by car he asked for how many kilometres/miles it is. Since traffic is everywhere; places will soon develop traffic, so distance by time is not always a factor for other clients. I told my client to get back on that concern within the day, and I made a research online. I got the site of Google Distance Calculator at Daftlogic.com and find it very useful with all my next projects. The Avida Settings Cavite, one of affordable housing development of Ayala Land Inc. under Avida Land Corp. 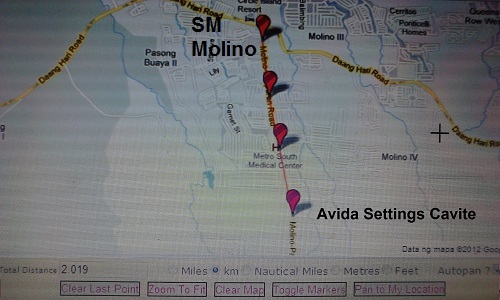 The project location is in Molino Bacoor Cavite. 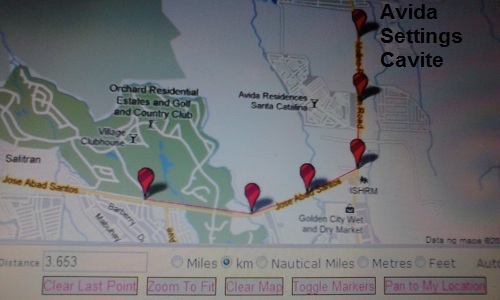 Let us try measuring its distance from Baclaran using Google Maps Distance Calculator at Daftlogic.com. 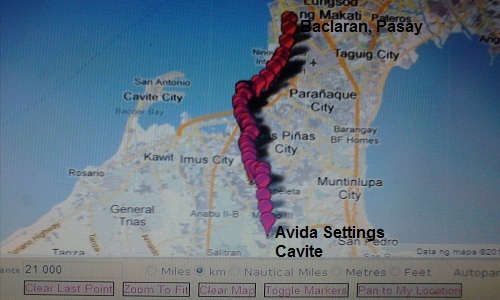 As shown above, the project Avida Settings Cavite is in prime location, having a 2 km. distance from SM Molino means a very accessible to shops your groceries and aside from the planned Town Center Mall managed by Ayala, infront of this project. While going to Baclaran is 20 km. away that might be a 25 to 30 minute drive in moderate traffic. Going to Alabang where you might be working is only 8.5 km via Daang-hari Road, add to that is it’s accessibility to public transportation. While if you want to be relaxed on weekend and playing golf, we have the Orchard Golf Course with only 3.6 km distance. The site Daftlogic.com had been very helpful in my expertise because it adds some knowledge and confidence in dealing clients. Clients themselves could also try it especially if cannot go to the site personally. Try it at Daftlogic.com, get back on us and give us your reviews. This is another useful article for housing buyers.. Thank you for this.